I did it!!! I seriously wasn’t sure if I would make it through the full cleanse. I have never done a juice cleanse before so I was a little scared when I committed to 5 full days. I certainly needed a detox though. Most of the time I try my best to eat pretty clean and healthy but its been a struggle since we started the renovations on our house and don’t have our own kitchen at the moment. So, a lot of our meals have been from restaurants these past few months (which I am not used to). 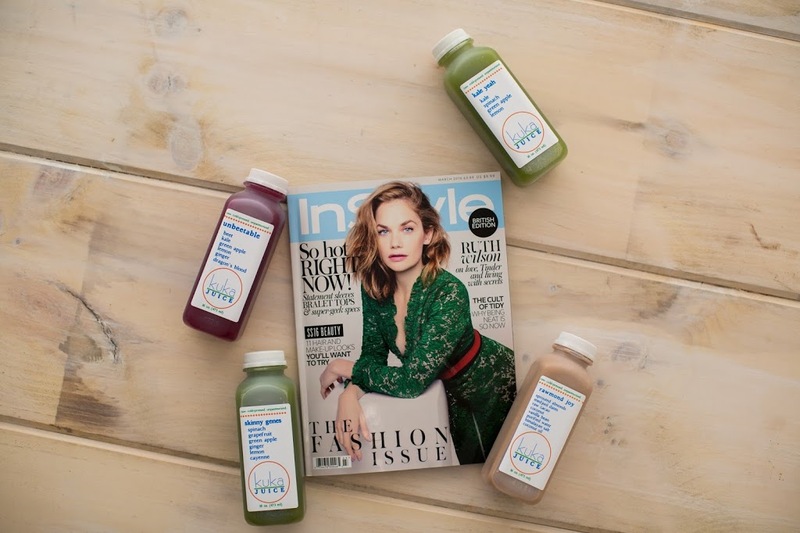 My workout routine has been good, my eating and nutrition not so much….which is why I needed a reset and had heard awesome reviews about the Kuka Juice Cleanse!! The first day I went to Kuka Juice and picked up my Cleanse for Days 1-3. Abigail gave me cleanse advice and great details. I had 6 total juices in a day. My days always started with a green juice, my favorite being Skinny Genes which included spinach, grapefruit, green apple, ginger, lemon & cayenne. I had 3 more green juices every 2 hours, then a juice called Unbeetable which I looked forward to everyday bc the flavor was so different and it included beets, and I saved the best for last (dinner time) the Raymond Joy Mylk. It was seriously amazing and tasted like chocolate milk but even better! Day 1: Super easy! I made it through without wanting anything to eat. I stayed full throughout the day and night and slept like a baby. Day 2: I had lots of energy so I decided to go to my morning workout at QSA and realized the cardio part was fine, but the weights I struggled with. (Note: I was told not to workout during the cleanse but I’ve never followed the rules…whoops). Made it through the workout and felt better than before I started, went home and made it through the day once again without feeling hungry or craving anything to eat. Day 3: Went back to my workout class because once again I can’t follow the rules, felt awesome, drank juice all day, got hungry later in the afternoon but cured it with a juice and made it through day 3! Day 4: I just want a filet and a glass of red wine…. I only have today and one more day so figured if I have made it this far Im not giving up! This was the hardest day for me mentally but knowing I was so close to being finished is what got me through. Day 5: Done! I do feel like I have a ton of energy and a lot better than before I started!! I noticed I didn’t have any stomach pains all week and never once felt bloated. I would definitely do it over again but would recommend starting with the 3 day cleanse if you are new to juicing. The juices were seriously delicious, I definitely have my favorites which included the ones with fruit and the milks. I am going to try to at least start off the day with a green juice everyday since it made me feel so good! I would recommend it 100% if you are looking for a good cleanse and to reset and feel better with lots more energy! Kuka Juice is located at 101 Falls Park Drive in Greenville SC. You can also order online here!! I did it!!! I seriously wasn’t sure if I would make it through the full cleanse. I have never done a juice cleanse before so I was a little scared when I committed to 5 full days. I certainly needed a detox though. Most of the time I try my best to eat pretty clean and healthy but its been a struggle since we started the renovations on our house and don’t have our own kitchen at the moment. So, a lot of our meals have been from restaurants these past few months (which I am not used to). 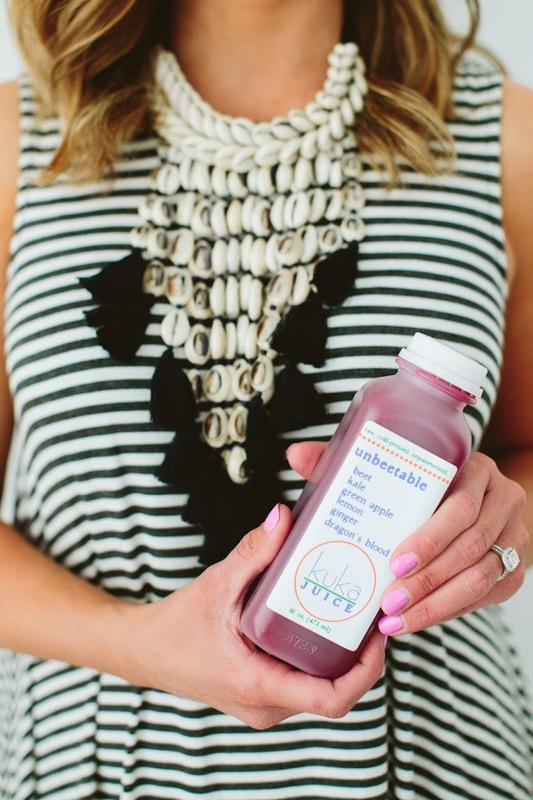 My workout routine has been great, my eating and nutrition not so much….which is why I needed a reset and had heard awesome reviews about the Kuka Juice Cleanse!! The first day I went to Kuka Juice and picked up my Cleanse for Days 1-3. Abigail gave me cleanse advice and great details. I had 6 total juices in a day. My days always started with a green juice, my favorite being Skinny Genes which included spinach, grapefruit, green apple, ginger, lemon & cayenne. I had 3 more green juices every 2 hours, a juice called Unbeetable which I looked forward to everyday bc the flavor was so different and it included beets, and then I saved the best for last (dinner time) the Raymond Joy Mylk. It was seriously amazing and tasted like chocolate milk but even better! Day 5: Done! I do feel like I have a ton of energy and a lot better than before I started!! I noticed I didn’t have any stomach pains all week and never once felt bloated. I would definitely do it over again but would recommend starting with the 3 day cleanse if you are new to juicing. The juices were seriously delicious, I definitely have my favorites, I am going to try to atleast start off the day with a green juice since it made me feel so good.